Tennis elbow is a painful condition that doesn't just affect those who play tennis. Knowing its causes and treatments will help you recover much quickly. Tennis elbow is the term used to describe when a person overuses their forearm, hand and arm muscles, resulting in an elbow pain. The term simply developed because tennis elbow is a significant issue that some tennis players suffer from. Despite the name, it isn’t necessary to play tennis in order to develop tennis elbow. 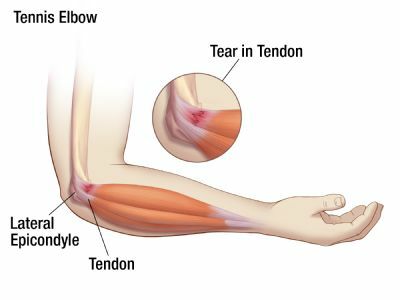 The location of the pain from tennis elbow is where certain of the tendons of the forearm muscles connect to the bone near the elbow. This pain is typically due to several small injuries or one larger injury to these particular tendons. The injury may lead to tiny tears in the tendon, causing scarring and inflammation. Most of the time, the injuries will be due to overusing the forearm muscles in repetitive motions or actions, like wringing clothes and manual work especially screw driving and other twisting movements. It is also possible to develop tendon injuries from playing racquet sports like tennis. Surprisingly enough, however, racquet sports are only responsible for around 5% of all cases. Almost always, tennis elbow will affect a person’s dominant arm. Pain which slowly increases surrounding the elbow’s outside section. In some cases, although less frequently, the pain may have a sudden onset. Pain worsens when you squeeze objects or shake hands. Pain worsens when you move or stabilize the wrist using force. Examples of actions include handling simple utensils (a toothbrush) to go back and forth, opening jars, using tools or lifting. Your doctor will consider multiple factors during their diagnosis, such as your participation in sports, your occupation, and the development of your symptoms. They will also discuss where exactly the symptoms occur and which activities trigger them. You should always tell your doctor if your elbow was ever injured, or there is a history of nerve disease or rheumatoid arthritis. Your doctor will most likely conduct several tests, some within the doctor’s office and some external ones. He may ask you to attempt to straighten your fingers and wrist while countering resistance. In some cases, your doctor will schedule an X-ray to eliminate the possibility of arthritis. MRIs can be used to check for arthritis or herniated disks in your neck as either of these conditions may also lead to arm pain. It is also possible to schedule an EMG to eliminate the possibility of nerve compression. Because there are many nerves surrounding the elbow, some symptoms of nerve compression mirror those of tennis elbow. The first recommendation of any doctor will most likely be to let your arm rest. This typically involves not doing any heavy work activities or participating in sports for a period of a few weeks. Non-steroidal anti-inflammatory medicines such as ibuprofen or aspirin can help eliminate or reduce the swelling and pain. In cases of patients who participate in racquet sports, many doctors will suggest that you get your equipment checked to ensure it fits properly. If a racquet is stiffer or looser-strung, it may reduce the stress exerted on your forearm, meaning that the muscles of the forearm won’t have to work as much. Sometimes you can prevent recurring symptoms by switching your oversized racquet to a smaller option. There are a range of specific exercises which can assist you by strengthening your forearm’s muscles. In some cases, your therapist may do an ice massage, ultrasound, or use muscle-stimulating techniques in order to improve the healing of your muscles. Some people experience relief of symptoms associated with tennis elbow by using a brace that centers on the back of the forearm. The brace works by allowing the tendons and muscles to rest. Certain steroids including cortisone can be incredibly effective options of anti-inflammatory medications. In some cases, your doctor will suggest relieving your symptoms by injecting the damaged muscle with a particular steroid. This shock wave therapy is a method of sending sound waves to your elbow. Each sound wave will create a “microtrauma” which in turn encourages the body to use its natural healing processes. Many doctors still consider shock wave therapy to be experimental, but multiple patients have success stories. This is typically only an option when the others were unsuccessful as more research is necessary to determine its effectiveness. During this procedure, they remove blood from you and inject it into the area surrounding your damaged elbow tendons. The theory is that the blood will help the tendons heal. During the procedure, you will have a local anaesthetic for pain relief; in some cases several sessions are necessary during this treatment. Sometimes you have to wear a splint following the surgery and physiotherapy may be recommended. This procedure can lead to damage to structures close to the tendon like blood vessels or nerves, infection, bruising, or pain. This treatment involves injecting botulinum toxin in the muscles of your forearm and has been shown to be effective. It tends to be considered as one of the last options before surgery. Generally speaking, your doctor will probably wait between six and twelve months before recommending you a surgical treatment. Most of these surgical procedures designed to treat tennis elbow will involve removing the diseased muscle by the doctor before reattaching your healthy muscle to the bone. In order to select the best surgical procedure, your doctor will consider multiple factors, such as your personal needs, general health, and the severity of the injury. Your doctor will talk with you about the various options. Make sure to ask about the risks of each procedure as well as results they have seen from them. This is the most common surgical treatment for tennis elbow or in it; the surgeon will make an incision above the elbow. This is usually an outpatient surgery and does not usually require you to spend the night at the hospital. This is also an outpatient procedure, but involves using tiny incisions and small surgical instruments. Anytime you undergo surgery, you will be faced with certain risks, including the need for future surgery, loss of flexibility, loss of strength, the possibility of prolonged rehabilitation, blood vessel and nerve damage, and infection. After your surgery, you may need to keep your arm in a splint for a week or so, at which time the sutures will be removed. When your splint is removed, you will start doing exercises to stretch your elbow and help restore flexibility. Around two months following surgery, you will gradually start with light strengthening exercises. You usually have to wait 4 to 6 months before doing athletic activities, and your doctor will tell you when it is safe to do so. Although loss of strength may occur, the surgery is successful for 80 to 90 percent of patients.